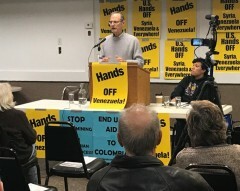 International speaking tour says reject Trump’s attacks on Venezuela | Fight Back! 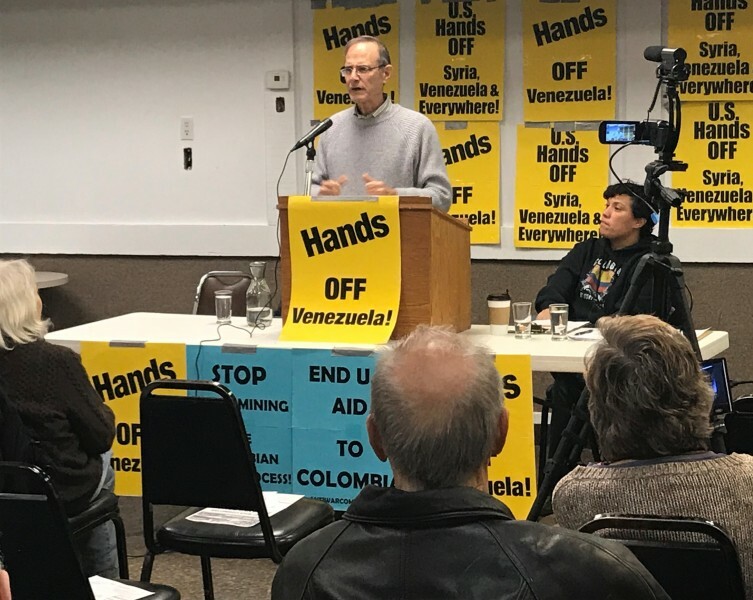 Minneapolis, MN - On November 10, more than 40 people gathered to hear Steve Ellner, a professor, writer and longtime Venezuela resident speak against U.S. sanctions and the Trump administration’s efforts to destabilize Venezuela. Successive U.S. administrations have steadily imposed new sanctions on Venezuela, using U.S. influence over international finance institutions to effectively block investment in the country’s struggling economy. On November 1, Trump’s national security advisor and former Iraq war planner John Bolton included Venezuela, alongside Cuba and Nicaragua, in a so-called “troika of tyranny” that the U.S. will seek to destabilize with the help of right-wing governments in Colombia and Brazil. In the past Trump has hinted at the possibility of a U.S.-backed military coup, or even a ground invasion, to overthrow Venezuela’s elected president Nicolás Maduro and his United Socialist Party (PSUV). Ellner highlighted the PSUV’s popular social programs, started under former president Hugo Chávez and continued by President Maduro, including reduced living costs for the poor; democratic Communal Councils that oversee development at the grassroots level, and promotion of Latin American unity against U.S. imperialism. “It’s important to understand these breakthroughs, in order to understand how damaging the sanctions, and the threats of military intervention and military coups, have been for Venezuela,” Ellner concluded. The event, which was part of Ellner’s speaking tour across the U.S. and Canada, was organized by the Minnesota Anti-War Committee and co-sponsored by the Minnesota Immigrant Rights Action Committee, Minnesota Peace Action Coalition, Women Against Military Madness, and Minnesota Cuba Committee.